"It was in the middle of that summer of endless rain that the first child went missing. It all started on a Tuesday, an odd sort of day that could have passed like any other, but ended up being one that profoundly changed the lives of a number of people." The Peril: It starts with a child's abduction from a Stockholm train. At first, the police suspect the girl's father. 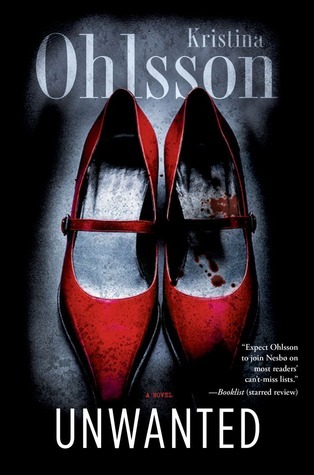 But when the little girl ends up dead, with the word 'Unwanted' written on her forehead, Inspector Alex Recht and police officer Fredrika Bergman soon realize they're hunting for a manipulative and ruthless murderer instead. My thoughts: I loved the pacing; this novel begins on Monday, ends on Sunday, and never slows down once in between. The characters are nicely complicated, too, especially Fredrika who's new to the squad and not exactly a people person. In fact, the other members of the squad don't think she's suited for this job at all, but it's Fredrika who spots connections in this case that the others don't. I liked her a lot. I also liked the mystery itself; it's compelling and unpredictable--the moments with the murderer are especially chilling, but not graphic or explicit, which I really appreciated. The subject matter is a little dark, though. All in all, this is a great R.I.P. 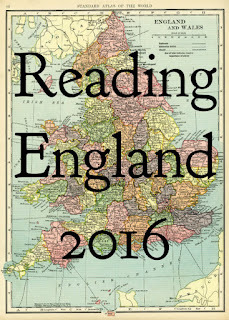 read (which stands for Readers Imbibing Peril). I'm hoping to read three more books with thrills and chills before the end of October. What about you? 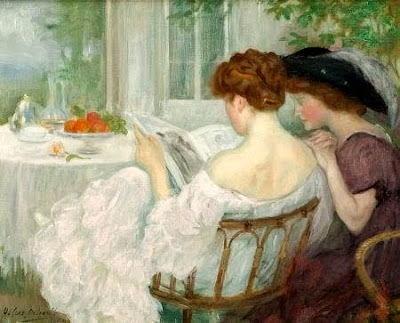 Read any good mysteries lately? After his wife leaves him, Grant Shongo returns to his family's cabin on Lake Canandaigua to reconnect with his ancestral spirits and to try and heal his heart. But he finds himself haunted not only by the memories of his past--memories of his parents, and of Echo O'Connell, the first and only girl he ever truly loved--but by the spirit of a little boy who drowned 12 years earlier. "There is nowhere else he could have gone but to the lake. Canandaigua is the place where he feels God in the trees...Time is different here: the minutes, hours, and days tracked by a set of different colors, smells, directions and strength of wind across the water...(The lake's) restlessness has always calmed him." But there are complications here, too. The dead boy's sister, Melanie, has gone missing. A wounded gray wolf shows up at Grant's door. And Echo returns. And Grant suddenly finds himself with a second chance at love and life. 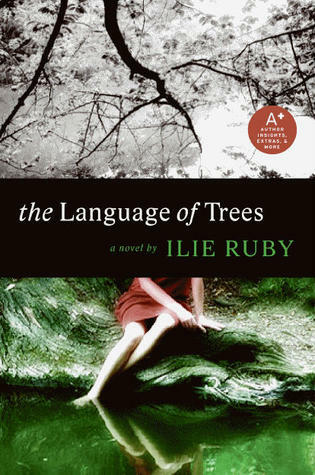 Ilie Ruby's novel is a story of regret and hope, second chances, forgiveness and love. The setting is beautifully described, and the Seneca legends and traditions add depth and interest. It's mostly Grant's story, but there are several other secondary story lines threaded through the narrative. I have to admit, I liked the chapters told from Grant's POV best; he's definitely my favorite character. I wouldn't have minded if the story had focused less on the mystery of Melanie's disappearance and more on Grant and Echo and their relationship , but overall, I liked this book. Especially the small touches of magic in it. 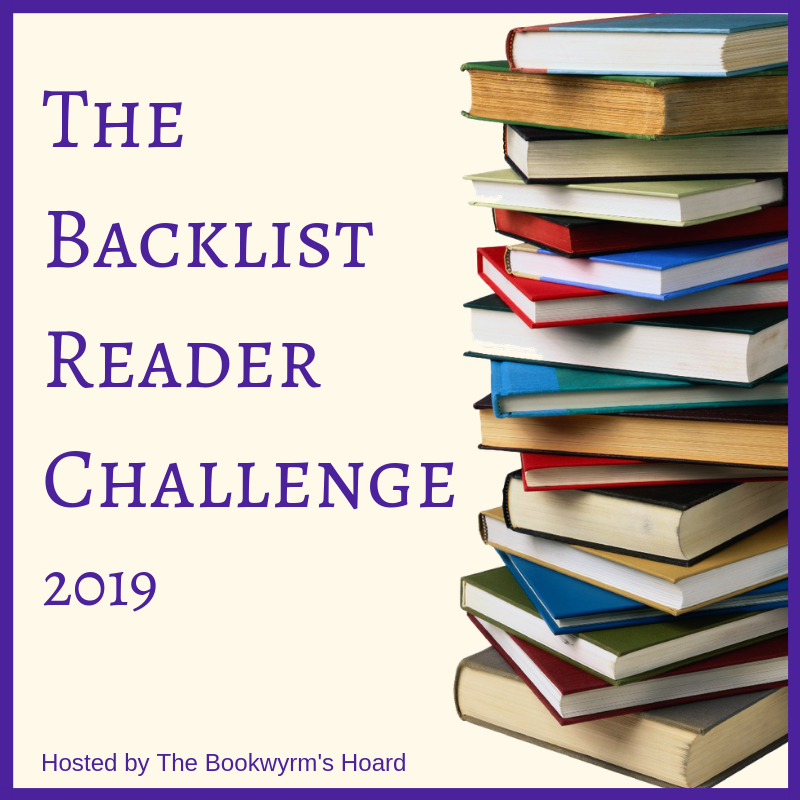 What's in a Name Reading Challenge: 5 books read; 1 to go! "I cannot imagine a day without reading in it." I have been a fan of Henry James ever since I first read The Portrait of a Lady. I love his command of language and how no matter how long his sentences may be, I never get lost in them. I love how he manages to find beauty in tragedy. But most of all, I love his characters. They are the reason I keep coming back to his books time and time again. The Europeans is one of his shorter, more accessible novels. 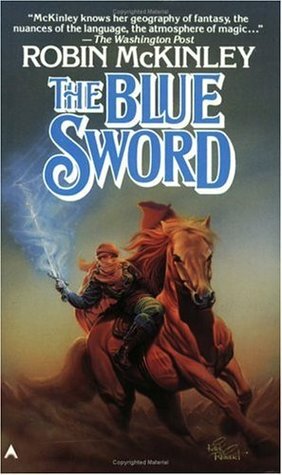 It is only 12 chapters (and 164 pages) long, but it offers up several memorable characters. Like Felix Young and his older sister, Eugenia, Baroness Munster, who come to visit their American cousins, the Wentworths, and to breathe some needed life and color into their straight-laced, sober Puritan lives. Eugenia is the driving force of the pair; she is clever, ambitious, brilliant rather than beautiful, and very European. "If she had come to seek her fortune, it seemed to her that her fortune would be easy to find." Her American cousins have never met anyone quite like her. Neither have the young men of their acquaintance--Robert Acton and Mr. Brand--who find themselves drawn to her. "When she desired to please she was...the most charming woman in the world," but "she was sometimes hard and perverse." Felix, on the other hand, is charming, good-humoured, and genial. He is delighted by Boston and by his American cousins. Painting portraits and sketching the scenery, Felix finds beauty every where and is able to "extract entertainment from all things." Styling himself a Bohemian, he does not take life too seriously. As he himself says, "I don't think it's what one does or one doesn't do that promotes enjoyment. It is the general way of looking at life." He sees all life as an opportunity, a much different philosophy than that shared by his solemn American cousins. The four Wentworths--Mr. Wentworth, his two daughters, Charlotte and Gertrude, and his son, Clifford--are drawn to their lively European cousins, but they're wary of them, too. Except for Gertrude. She's the kind of girl who skips church because the sky is a particular shade of blue; and she's always been restless without knowing exactly why. Her imagination runs deep and in the warmth and brilliance of Felix's and Eugenia's company, her true nature finally awakens and comes to life. She's the most changed by their visit. I love these characters, and this story. But then, I love all of Henry James' novels. In classic literature, he reigns supreme. I tackled my bookshelves this weekend--I needed to do some rearranging to make room for new books, as well as some decluttering and re-alphabetizing, and I noticed that I was missing a couple of letters of the alphabet in my small assemblage of authors. It didn't surprise me when I had no books by authors whose last names start with an X or Q, but it did surprise me that I was also missing I and U. Last names that start with those letters aren't that uncommon, are they? But then, when I tried to come up with some author names that begin with either letter, I came up blank. I couldn't think of a single one. (Can you?) I know there are some, but they don't exist on my bookshelves. Which struck me as a little strange. I mean, I have books for Z (Zafon and Zigman) and Y (Young), but not for I or U. It's a bookish incongruity. What about you? What letters of the alphabet are missing from your bookshelves? "The women had taken over the United States by 1998." Except in Texas. Texas is still Man's Land where "the soil...was rich and nourishing for the transplanted male chauvinist." So, when journalist Dave Hull's girlfriend is promoted over him, he decides to go to Texas where men still ride horses and carry guns. 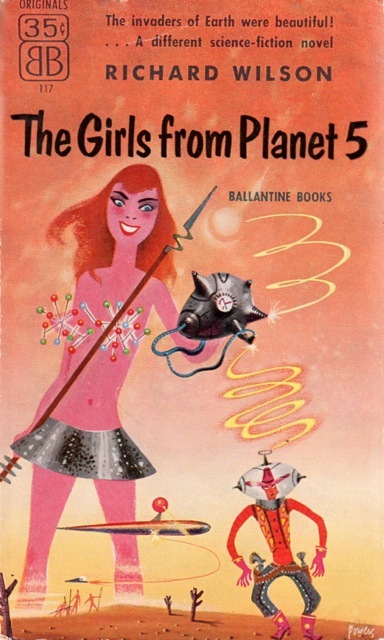 Add to this mix an alien invasion of Lyru--a race of beautiful warrior women secretly controlled by a sect of old Crones--and you have the beginning of Richard Wilson's entertaining science fiction novel The Girls from Planet 5. Published in 1955, Wilson creates "a topsy-turvy society where all the women act like men and too many men think they have to act like women" and one of the more unique extraterrestrial invasions ever written. What these beautiful alien invaders really want is unclear, but it just might fall to Texas to come to the country's rescue. I picked this book up on a whim last month mostly because the cover and the premise made me laugh. And so did the book. Especially the whole thing with Texas. I also liked Dave Hull and Lori, the Lyru girl he meets. Is this book great literature? No. But it is an amusing take on the battle of the sexes. Wilson seems to be poking fun at both militant feminists and male chauvinists as well as the 1950s mindset on the traditional roles of men and women. It is not a novel to be taken too seriously. As Wilson himself said, "Writing, particularly science fiction writing, is fun--or should be. I enjoy putting predictable people in an unlikely situation and letting them get out of it as logically as they can. If a little hilarity creeps in, fine, but instruction, no. One whose nearest encounter to the sciences consisted of flunking intermediate algebra twice in high school and once in college can pretend to instruct no one." So, if you're looking for a little science fiction fun, give this crazy book a try. It'll definitely make you smile. and a small suitcase full of inappropriate clothes." One woman, four camels, a dog named Diggity and a 1700 mile trek across the Australian outback. Robyn Davidson's Tracks is one of my all-time favorite travel/memoir/adventure books. With four stubborn, sassy and mischievous camels, Davidson travels from Alice Springs across the vast and forbidding Gibson Desert to the western coast of Australia ... alone. It's a crazy, poignant and brave journey. Her funny mishaps with the camels always make me laugh, but it's the inward journey she makes along the way--that hard-earned discovery of truth and self--that I remember most. This is a thoughtful and empowering book. "The two important things that I did learn were that you are as powerful and strong as you allow yourself to be, and that the most difficult part of any endeavor is taking the first step, making the first decision." "To be free is to learn, to test yourself constantly, to gamble. It is not safe. I had learnt to use my fears as stepping stones rather than stumbling blocks, and best of all I had learnt to laugh." What color are you in the mood to read? In Japan, when a person mysteriously disappears they attribute it to kamikakushi. Kamikakushi "most often takes place in the springtime, usually at dusk. Before the disappearance takes place, a strong wind always blows. If the person who is spirited away is lucky enough to return home, he or she never retains any memory of where he or she has been. Naturally, that leads people to concoct all sorts of explanations for the mysterious experiences." Saeko is a free-lance journalist whose father went missing in 1884. Now, eighteen years later, she and TV director Hashiba are investigating several new disappearances. What do these missing persons have in common? They all disappeared near an active fault line on a day with unusually high sunspot activity. That's not the only strange phenomena occurring; the value of Pi has mysteriously changed overnight, and it looks as if the stars are starting to disappear one by one. "If the world as we know it ever begins to collapse, then our first signal would be a small shift in mathematics." 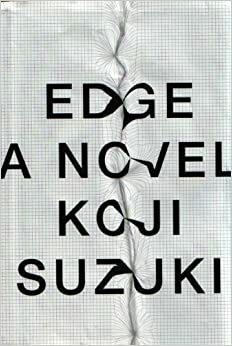 Koji Suzuki's novel Edge is not only unusual, it's unusually cool. As Saeko and Hashiba begin to put together all the pieces of this puzzling mystery, it just gets stranger and stranger. But I think that's why I liked it so much. 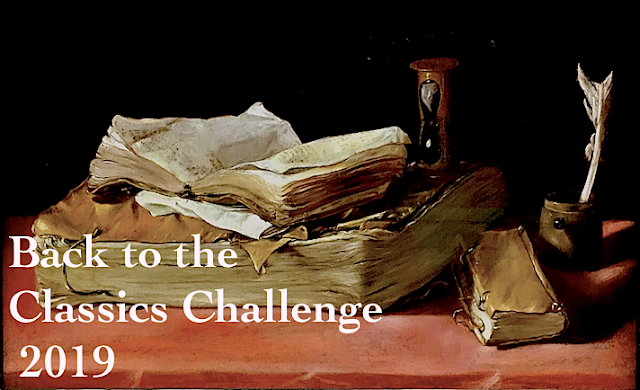 There's a little bit of everything in this novel from number theory to quantum mechanics. Saeko's relationship with her father is also a key component. There's so much to this novel! It's complicated, haunting and completely unique. Suzuki does a masterful job of creating tension out of nothing. And you'll never guess the ending. When I think of Leonard Woolf, I think of Boomsbury, the Hogarth Press and his wife, Virginia; I don't think of compelling fiction novels. 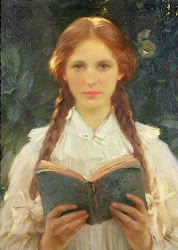 But in 1914, Woolf's second novel, The Wise Virgins, was published. It's about Harry Davis, a young cynic, the elegant Camilla Lawrence whom he loves, and the four virginal Garland girls who live next door. Woolf based all of his characters on people he knew. Harry is clearly Leonard himself, while Camilla is based on Virginia. The portrayals are well-drawn, witty, and at times a bit scathing. (Something that didn't exactly go over well when the book first came out.) I found Woolf's writing intelligent, his story well-crafted, and his observations of society cynical, but also honest and amusing. And I really enjoyed this book. 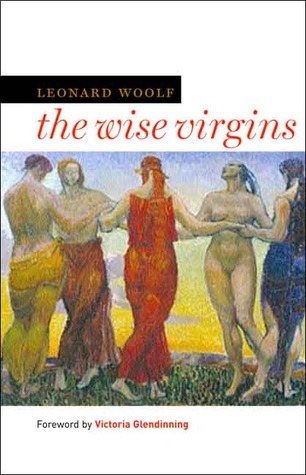 Sadly, The Wise Virgins was Leonard Woolf's last fiction novel.